Zinc finger and BTB domain-containing protein 16 is a protein that in humans is encoded by the ZBTB16 gene. This gene is a member of the Krueppel C2H2-type zinc-finger protein family and encodes a zinc finger transcription factor that contains nine Kruppel-type zinc finger domains at the carboxyl terminus. 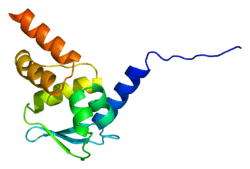 This protein is located in the nucleus, is involved in cell cycle progression, and interacts with a histone deacetylase. Specific instances of aberrant gene rearrangement at this locus have been associated with acute promyelocytic leukemia (APL) and physiological roles have been identified in mouse Natural Killer T cells and gamma-delta T cells. Alternate transcriptional splice variants have been characterized in human. ↑ "Diseases that are genetically associated with ZBTB16 view/edit references on wikidata". ↑ Chen Z, Brand NJ, Chen A, Chen SJ, Tong JH, Wang ZY, Waxman S, Zelent A (1993). "Fusion between a novel Krüppel-like zinc finger gene and the retinoic acid receptor-alpha locus due to a variant t(11;17) translocation associated with acute promyelocytic leukaemia". The EMBO Journal. 12 (3): 1161–7. PMC 413318 . PMID 8384553. ↑ Kovalovsky D, Uche OU, Eladad S, Hobbs RM, Yi W, Alonzo E, Chua K, Eidson M, et al. (2008). "The BTB-zinc finger transcriptional regulator, PLZF, controls the development of iNKT cell effector functions". Nature Immunology. 9 (9): 1055–64. doi:10.1038/ni.1641. PMC 2662733 . PMID 18660811. ↑ Savage AK, Constantinides MG, Han J, Picard D, Martin E, Li B, Lantz O, Bendelac A (2008). "The transcription factor PLZF (Zbtb16) directs the effector program of the NKT cell lineage". Immunity. 29 (3): 391–403. doi:10.1016/j.immuni.2008.07.011. PMC 2613001 . PMID 18703361. ↑ Kreslavsky T, Savage AK, Hobbs R, Gounari F, Bronson R, Pereira P, Pandolfi PP, Bendelac A, von Boehmer H (2009). "TCR-inducible PLZF transcription factor required for innate phenotype of a subset of γδ T cells with restricted TCR diversity". Proceedings of the National Academy of Sciences of the United States of America. 106 (30): 12453–8. doi:10.1073/pnas.0903895106. PMC 2718370 . PMID 19617548. ↑ Zhang T, Xiong H, Kan LX, Zhang CK, Jiao XF, Fu G, Zhang QH, Lu L, et al. (1999). "Genomic sequence, structural organization, molecular evolution, and aberrant rearrangement of promyelocytic leukemia zinc finger gene". Proceedings of the National Academy of Sciences of the United States of America. 96 (20): 11422–7. doi:10.1073/pnas.96.20.11422. PMC 18049 . PMID 10500192. ↑ "ZBTB16 zinc finger and BTB domain containing 16". Entrez. 4 October 2009. Retrieved 10 October 2009. ↑ Senbonmatsu T, Saito T, Landon EJ, Watanabe O, Price E, Roberts RL, Imboden H, Fitzgerald TG, et al. "A novel angiotensin II type 2 receptor signaling pathway: possible role in cardiac hypertrophy". EMBO J. 22 (24): 6471–82. doi:10.1093/emboj/cdg637. PMC 291832 . PMID 14657020. ↑ Dhordain P, Albagli O, Honore N, Guidez F, Lantoine D, Schmid M, The HD, Zelent A, Koken MH. "Colocalization and heteromerization between the two human oncogene POZ/zinc finger proteins, LAZ3 (BCL6) and PLZF". Oncogene. 19 (54): 6240–50. doi:10.1038/sj.onc.1203976. PMID 11175338. ↑ Barna M, Merghoub T, Costoya JA, Ruggero D, Branford M, Bergia A, Samori B, Pandolfi PP. "Plzf mediates transcriptional repression of HoxD gene expression through chromatin remodeling". Dev. Cell. 3 (4): 499–510. doi:10.1016/s1534-5807(02)00289-7. PMID 12408802. 1 2 Ward JO, McConnell MJ, Carlile GW, Pandolfi PP, Licht JD, Freedman LP. "The acute promyelocytic leukemia-associated protein, promyelocytic leukemia zinc finger, regulates 1,25-dihydroxyvitamin D(3)-induced monocytic differentiation of U937 cells through a physical interaction with vitamin D(3) receptor". Blood. 98 (12): 3290–300. doi:10.1182/blood.v98.12.3290. PMID 11719366. ↑ Puccetti E, Obradovic D, Beissert T, Bianchini A, Washburn B, Chiaradonna F, Boehrer S, Hoelzer D, et al. "AML-associated translocation products block vitamin D(3)-induced differentiation by sequestering the vitamin D(3) receptor". Cancer Res. 62 (23): 7050–8. PMID 12460926. ↑ McLoughlin P, Ehler E, Carlile G, Licht JD, Schäfer BW. "The LIM-only protein DRAL/FHL2 interacts with and is a corepressor for the promyelocytic leukemia zinc finger protein". J. Biol. Chem. 277 (40): 37045–53. doi:10.1074/jbc.M203336200. PMID 12145280. ↑ Labbaye C, Quaranta MT, Pagliuca A, Militi S, Licht JD, Testa U, Peschle C. "PLZF induces megakaryocytic development, activates Tpo receptor expression and interacts with GATA1 protein". Oncogene. 21 (43): 6669–79. doi:10.1038/sj.onc.1205884. PMID 12242665. ↑ Tsuzuki S, Enver T. "Interactions of GATA-2 with the promyelocytic leukemia zinc finger (PLZF) protein, its homologue FAZF, and the t(11;17)-generated PLZF-retinoic acid receptor alpha oncoprotein". Blood. 99 (9): 3404–10. doi:10.1182/blood.v99.9.3404. PMID 11964310. 1 2 3 4 Chauchereau A, Mathieu M, de Saintignon J, Ferreira R, Pritchard LL, Mishal Z, Dejean A, Harel-Bellan A. "HDAC4 mediates transcriptional repression by the acute promyelocytic leukaemia-associated protein PLZF". Oncogene. 23 (54): 8777–84. doi:10.1038/sj.onc.1208128. PMID 15467736. 1 2 3 David G, Alland L, Hong SH, Wong CW, DePinho RA, Dejean A. "Histone deacetylase associated with mSin3A mediates repression by the acute promyelocytic leukemia-associated PLZF protein". Oncogene. 16 (19): 2549–56. doi:10.1038/sj.onc.1202043. PMID 9627120. 1 2 3 Wong CW, Privalsky ML. "Components of the SMRT corepressor complex exhibit distinctive interactions with the POZ domain oncoproteins PLZF, PLZF-RARalpha, and BCL-6". J. Biol. Chem. 273 (42): 27695–702. doi:10.1074/jbc.273.42.27695. PMID 9765306. 1 2 Lemercier C, Brocard MP, Puvion-Dutilleul F, Kao HY, Albagli O, Khochbin S. "Class II histone deacetylases are directly recruited by BCL6 transcriptional repressor". J. Biol. Chem. 277 (24): 22045–52. doi:10.1074/jbc.M201736200. PMID 11929873. ↑ Nanba D, Mammoto A, Hashimoto K, Higashiyama S. "Proteolytic release of the carboxy-terminal fragment of proHB-EGF causes nuclear export of PLZF". J. Cell Biol. 163 (3): 489–502. doi:10.1083/jcb.200303017. PMC 2173632 . PMID 14597771. ↑ Nanba D, Toki F, Higashiyama S. "Roles of charged amino acid residues in the cytoplasmic domain of proHB-EGF". Biochem. Biophys. Res. Commun. 320 (2): 376–82. doi:10.1016/j.bbrc.2004.05.176. PMID 15219838. ↑ Takahashi S, McConnell MJ, Harigae H, Kaku M, Sasaki T, Melnick AM, Licht JD. "The Flt3 internal tandem duplication mutant inhibits the function of transcriptional repressors by blocking interactions with SMRT". Blood. 103 (12): 4650–8. doi:10.1182/blood-2003-08-2759. PMID 14982881. ↑ Hong SH, David G, Wong CW, Dejean A, Privalsky ML. "SMRT corepressor interacts with PLZF and with the PML-retinoic acid receptor alpha (RARalpha) and PLZF-RARalpha oncoproteins associated with acute promyelocytic leukemia". Proc. Natl. Acad. Sci. U.S.A. 94 (17): 9028–33. doi:10.1073/pnas.94.17.9028. PMC 23013 . PMID 9256429. ↑ Koken MH, Reid A, Quignon F, Chelbi-Alix MK, Davies JM, Kabarowski JH, Zhu J, Dong S, et al. "Leukemia-associated retinoic acid receptor alpha fusion partners, PML and PLZF, heterodimerize and colocalize to nuclear bodies". Proc. Natl. Acad. Sci. U.S.A. 94 (19): 10255–60. doi:10.1073/pnas.94.19.10255. PMC 23349 . PMID 9294197. ↑ Melnick AM, Westendorf JJ, Polinger A, Carlile GW, Arai S, Ball HJ, Lutterbach B, Hiebert SW, Licht JD. "The ETO protein disrupted in t(8;21)-associated acute myeloid leukemia is a corepressor for the promyelocytic leukemia zinc finger protein". Mol. Cell. Biol. 20 (6): 2075–86. doi:10.1128/mcb.20.6.2075-2086.2000. PMC 110824 . PMID 10688654. ↑ Melnick A, Carlile GW, McConnell MJ, Polinger A, Hiebert SW, Licht JD. "AML-1/ETO fusion protein is a dominant negative inhibitor of transcriptional repression by the promyelocytic leukemia zinc finger protein". Blood. 96 (12): 3939–47. PMID 11090081. ↑ Martin PJ, Delmotte MH, Formstecher P, Lefebvre P. "PLZF is a negative regulator of retinoic acid receptor transcriptional activity". Nucl. Recept. 1 (1): 6. doi:10.1186/1478-1336-1-6. PMC 212040 . PMID 14521715. ↑ Hoatlin ME, Zhi Y, Ball H, Silvey K, Melnick A, Stone S, Arai S, Hawe N, et al. "A novel BTB/POZ transcriptional repressor protein interacts with the Fanconi anemia group C protein and PLZF". Blood. 94 (11): 3737–47. PMID 10572087. Chen Z, Brand NJ, Chen A, Chen SJ, Tong JH, Wang ZY, Waxman S, Zelent A (1993). "Fusion between a novel Krüppel-like zinc finger gene and the retinoic acid receptor-alpha locus due to a variant t(11;17) translocation associated with acute promyelocytic leukaemia". The EMBO Journal. 12 (3): 1161–7. PMC 413318 . PMID 8384553. Chen SJ, Zelent A, Tong JH, Yu HQ, Wang ZY, Derré J, Berger R, Waxman S, Chen Z (1993). "Rearrangements of the retinoic acid receptor alpha and promyelocytic leukemia zinc finger genes resulting from t(11;17)(q23;q21) in a patient with acute promyelocytic leukemia". The Journal of Clinical Investigation. 91 (5): 2260–7. doi:10.1172/JCI116453. PMC 288229 . PMID 8387545. Reid A, Gould A, Brand N, Cook M, Strutt P, Li J, Licht J, Waxman S, et al. (1995). "Leukemia translocation gene, PLZF, is expressed with a speckled nuclear pattern in early hematopoietic progenitors". Blood. 86 (12): 4544–52. PMID 8541544. Dong S, Zhu J, Reid A, Strutt P, Guidez F, Zhong HJ, Wang ZY, Licht J, et al. (1996). 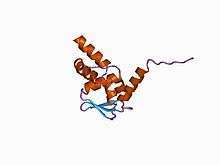 "Amino-terminal protein-protein interaction motif (POZ-domain) is responsible for activities of the promyelocytic leukemia zinc finger-retinoic acid receptor-alpha fusion protein". Proceedings of the National Academy of Sciences of the United States of America. 93 (8): 3624–9. doi:10.1073/pnas.93.8.3624. PMC 39661 . PMID 8622986. Bonaldo MF, Lennon G, Soares MB (1996). "Normalization and subtraction: two approaches to facilitate gene discovery". Genome Research. 6 (9): 791–806. doi:10.1101/gr.6.9.791. PMID 8889548. Hong SH, David G, Wong CW, Dejean A, Privalsky ML (1997). "SMRT corepressor interacts with PLZF and with the PML-retinoic acid receptor α (RARα) and PLZF-RARα oncoproteins associated with acute promyelocytic leukemia". Proceedings of the National Academy of Sciences of the United States of America. 94 (17): 9028–33. doi:10.1073/pnas.94.17.9028. PMC 23013 . PMID 9256429. Koken MH, Reid A, Quignon F, Chelbi-Alix MK, Davies JM, Kabarowski JH, Zhu J, Dong S, et al. (1997). "Leukemia-associated retinoic acid receptor α fusion partners, PML and PLZF, heterodimerize and colocalize to nuclear bodies". Proceedings of the National Academy of Sciences of the United States of America. 94 (19): 10255–60. doi:10.1073/pnas.94.19.10255. PMC 23349 . PMID 9294197. Lin RJ, Nagy L, Inoue S, Shao W, Miller WH, Evans RM (1998). "Role of the histone deacetylase complex in acute promyelocytic leukaemia". Nature. 391 (6669): 811–4. doi:10.1038/35895. PMID 9486654. Guidez F, Ivins S, Zhu J, Söderström M, Waxman S, Zelent A (1998). "Reduced retinoic acid-sensitivities of nuclear receptor corepressor binding to PML- and PLZF-RARalpha underlie molecular pathogenesis and treatment of acute promyelocytic leukemia". Blood. 91 (8): 2634–42. PMID 9531570. David G, Alland L, Hong SH, Wong CW, DePinho RA, Dejean A (1998). "Histone deacetylase associated with mSin3A mediates repression by the acute promyelocytic leukemia-associated PLZF protein". Oncogene. 16 (19): 2549–56. doi:10.1038/sj.onc.1202043. PMID 9627120. Ahmad KF, Engel CK, Privé GG (1998). "Crystal structure of the BTB domain from PLZF". Proceedings of the National Academy of Sciences of the United States of America. 95 (21): 12123–8. doi:10.1073/pnas.95.21.12123. PMC 22795 . PMID 9770450.
van Schothorst EM, Prins DE, Baysal BE, Beekman M, Licht JD, Waxman S, Zelent A, Cornelisse CJ, et al. (1999). "Genomic structure of the human PLZF gene". Gene. 236 (1): 21–4. doi:10.1016/S0378-1119(99)00277-2. PMID 10433962. Ball HJ, Melnick A, Shaknovich R, Kohanski RA, Licht JD (1999). "The promyelocytic leukemia zinc finger (PLZF) protein binds DNA in a high molecular weight complex associated with cdc2 kinase". Nucleic Acids Research. 27 (20): 4106–13. doi:10.1093/nar/27.20.4106. PMC 148680 . PMID 10497277. Zhang T, Xiong H, Kan LX, Zhang CK, Jiao XF, Fu G, Zhang QH, Lu L, et al. (1999). "Genomic sequence, structural organization, molecular evolution, and aberrant rearrangement of promyelocytic leukemia zinc finger gene". Proceedings of the National Academy of Sciences of the United States of America. 96 (20): 11422–7. doi:10.1073/pnas.96.20.11422. PMC 18049 . PMID 10500192. Li X, Peng H, Schultz DC, Lopez-Guisa JM, Rauscher FJ, Marmorstein R (1999). "Structure-function studies of the BTB/POZ transcriptional repression domain from the promyelocytic leukemia zinc finger oncoprotein". Cancer Research. 59 (20): 5275–82. PMID 10537309. Hoatlin ME, Zhi Y, Ball H, Silvey K, Melnick A, Stone S, Arai S, Hawe N, et al. (1999). "A novel BTB/POZ transcriptional repressor protein interacts with the Fanconi anemia group C protein and PLZF". Blood. 94 (11): 3737–47. PMID 10572087. Melnick AM, Westendorf JJ, Polinger A, Carlile GW, Arai S, Ball HJ, Lutterbach B, Hiebert SW, Licht JD (2000). "The ETO Protein Disrupted in t(8;21)-Associated Acute Myeloid Leukemia Is a Corepressor for the Promyelocytic Leukemia Zinc Finger Protein". Molecular and Cellular Biology. 20 (6): 2075–86. doi:10.1128/MCB.20.6.2075-2086.2000. PMC 110824 . PMID 10688654. Hyman J, Chen H, Di Fiore PP, De Camilli P, Brunger AT (2000). "Epsin 1 Undergoes Nucleocytosolic Shuttling and Its Eps15 Interactor Nh2-Terminal Homology (Enth) Domain, Structurally Similar to Armadillo and Heat Repeats, Interacts with the Transcription Factor Promyelocytic Leukemia Zn2+ Finger Protein (Plzf)". The Journal of Cell Biology. 149 (3): 537–46. doi:10.1083/jcb.149.3.537. PMC 2174850 . PMID 10791968. Melnick A, Carlile GW, McConnell MJ, Polinger A, Hiebert SW, Licht JD (2000). "AML-1/ETO fusion protein is a dominant negative inhibitor of transcriptional repression by the promyelocytic leukemia zinc finger protein". Blood. 96 (12): 3939–47. PMID 11090081. Beez S, Demmer P, Puccetti E (2012). "Targeting the Acute Promyelocytic Leukemia-Associated Fusion Proteins PML/RARα and PLZF/RARα with Interfering Peptides". PLoS ONE. 7 (11): e48636. doi:10.1371/journal.pone.0048636. PMC 3494703 . PMID 23152790. He LZ, Bhaumik M, Tribioli C, Rego EM, Ivins S, Zelent A, Pandolfi PP (2000). "Two critical hits for promyelocytic leukemia". Molecular Cell. 6 (5): 1131–41. doi:10.1016/S1097-2765(00)00111-8. PMID 11106752.